Library Home / About Us / 2018 / January / 04 / UBC Library acquires the first item ever printed in Vancouver. UBC Library’s Rare Books & Special Collections has acquired the first item ever printed in the city of Vancouver. 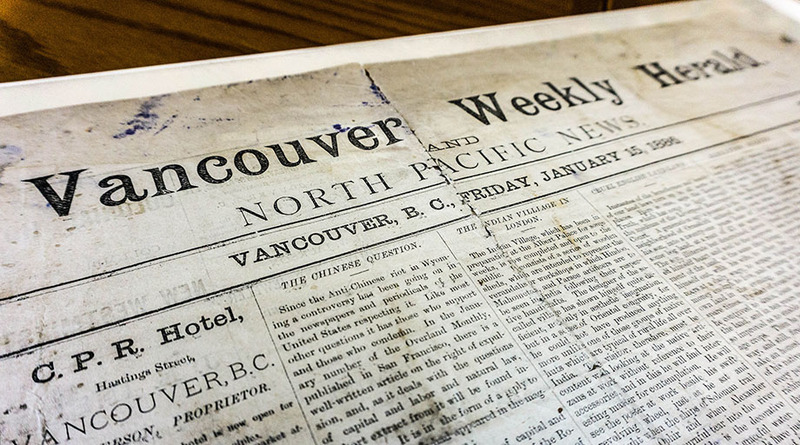 The first edition of The Vancouver Weekly Herald and North Pacific News was published on Friday, January 15, 1886. Printed in seven columns, the front page of the newspaper contains many local advertisements, histories of the Granville and Vancouver townsites, reportage of the meeting of locals to draft a request for incorporation and a column entitled “The Chinese Question”. According to research to date, it is the only surviving copy. Its publisher, Richard H. Alexander, was an Overlander who came to British Columbia in 1862 and was active in various enterprises, including working at and managing Hastings Mill in the 1870s. He later occupied many influential positions in Vancouver business and politics. The item was acquired through a private seller and will be added to the Library’s Chung Collection, a collection of archival documents, photographs, books and artifacts related to three broad themes: British Columbia History, Immigration and Settlement and the Canadian Pacific Railway Company. “Because of the content in some of the articles, this item would be a welcome addition to our Chung Collection” adds Kalsbeek. The newspaper, which is just beginning to separate along its edges and has slight mottling and staining, can be viewed in person by booking a tour of UBC Library’s Rare Books and Special Collections. View the digitized newspaper in our Open Collections.